Team Jersey have announced that lawn bowler Karina Bisson will be the Channel Islands team's flag bearer at the Commonwealth Games in Delhi. Bisson will lead out the 31-strong team of Jersey athletes at the Games' opening ceremony on Sunday. 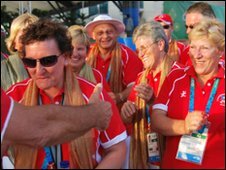 Bisson told BBC Jersey: "I'm feeling very proud about leading Team Jersey out into the Commonwealth Games and we've got a great team spirit going. "It's my dream come true so it's just amazing," she added. Bisson captained the Jersey team that won the women's fours at the 2009 British Championships at Les Creux Bowls Club. Jersey will be represented in eight different sports at the Games.